I hope you aren’t tired of me…I know I have been posting a little more often than normal. I will slow down again in another week or so but for now I have a lot to share! Up today is a 2016 Printable Monthly Calendar. I feel like I gave birth to this thing! I’ve been working on it a little at a time for several months and finally it is all finished. I wanted to do this last year but didn’t give myself enough time…and even though I love this design I already have ideas for next year. 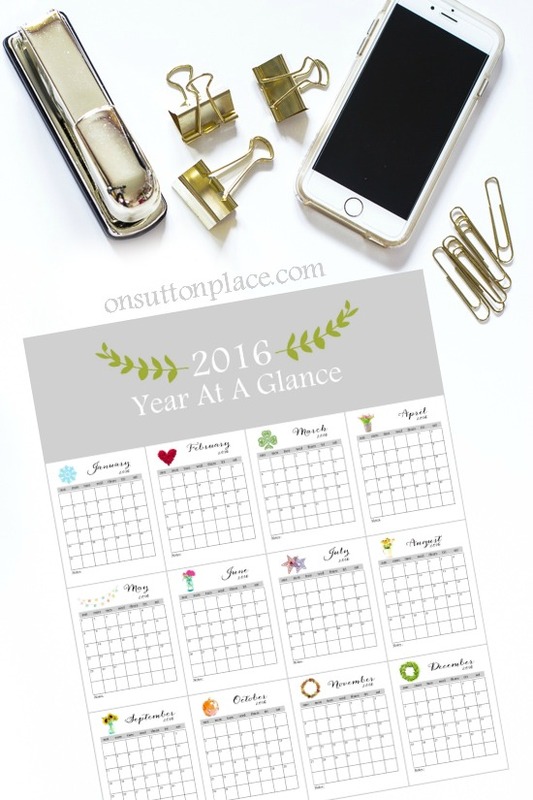 Included is a one-page year at a glance sheet along with the 12 individual months. The pages fit perfectly on an 8.5 x 11 sheet of paper. I printed each one myself to make sure. They can be put in a small notebook or hung on a bulletin board…or on the refrigerator. 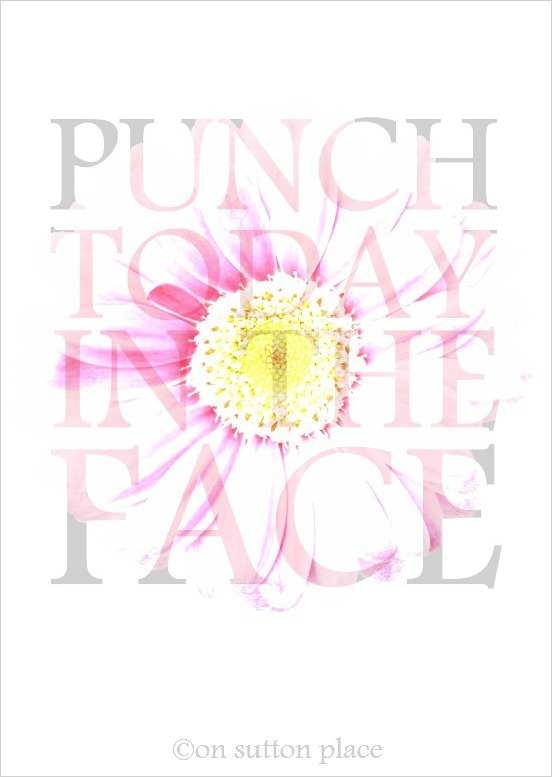 In addition to the calendar pages, I’ve included an inspirational printable that you can use as a reminder to make each day count, even if it’s in a very small way. I still want to make a weekly planner sheet and will get that to you before the end of the year. Sometimes seeing a week all in one place is so helpful. 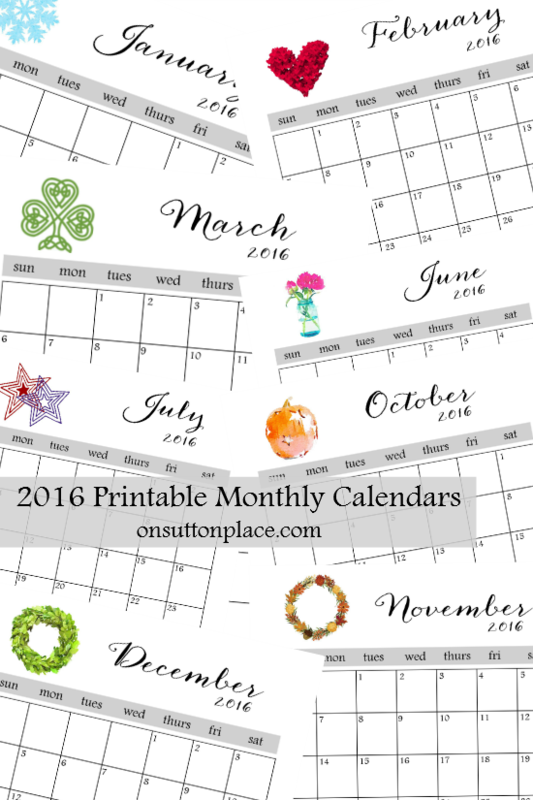 CLICK HERE TO DOWNLOAD THE 2016 PRINTABLE MONTHLY CALENDAR! I’ll be back in a few days with some packaging ideas for the Eggnog Bread and Homemade Vanilla. I’ll have a mini Christmas tour of our home and hopefully one more easy craft. (Not buffalo plaid!) If you haven’t entered my reader appreciation giveaway just click HERE. See you soon…12 days until Christmas! Wow – thanks for this. I needed a PERFECT planner and that is what you created! How generous of you to share with us. Thank you for the practical and attractive calendar that I could use for my class. Thank you! I was in need of a calendar for the computer area. I couldn’t find one of those little ones this year at Michaels. Thanks again! Lovely calendar. Now that I’ve retired I use the phone less for appointments and this is just right for the frig. Thank you and Happy 2016! Thank you. The calendar is lovely and just right! Thank you!! I’ve been looking all over for a year-at-a-glance calendar to track my running mileage for the year. Yours is not only functional but so pretty as well! Happy new year. Thank You for this printable calendar. Monthly and year at a glance. It is lovely and will be used!! Love this download – just what I needed! Ann, I feel as though I know you and will NEVER tire of your posts! The downloads you give us so freely are amazing…and I, with no artistic ability, appreciate them so much! I would never tire of your posts. I thoroughly enjoy all of your posts and look to you for inspiration! I love the calendars and your blog. The simplicity of it is refreshing and beautiful! Thank you! I never get tired of you! Your site is the first one of my favorites I check. Merry Christmas. I love your posts…Thank you for the calendars! Thanks for the calendars. Your posts are wonderful. Keep them coming. Thanks so much for the calendars. Your posts are a joy. Thank you for this calendar! It is an item I can use, & use many times & places!!! Thanks so much for the calendar. Love it. 2015 has been a wonderful year with you. You have inspired me with your cute and practical ideas. Merry Christmas to you and yours. What a wonderful calendar. I don’t have a printer, so I can’t download it :-( but I love it! I love the calendars, thanks so much for creating them! I laughed out loud when I saw the printable and will hang it some place where I’ll see it every day :) Merry Christmas! Hi Jody! I hope you are doing well. Merry Christmas to you and your family! A little smile crosses my face whenever I see a message from Sutton Place in my inbox, cuz I just know I’m in for a treat. Your calendar is a real gem, so pretty and practical–like all of your posts. Thank you for your generous heart, thank you for the creativity and beauty you add to my home, to my life. I can never have too much of that! Merry, merry Christmas, my friend. And I look forward to continuing this journey into 2016 together! Ann, thank you so much for your generosity and your beautiful calendar. Mine is going into a frame with a dry erase surface so that I don’t have to write directly on your prints! Far too pretty. How did you know I’m in need of a calendar? Thanks so much for all of your creative ideas and inspirations! Ann, thank you for all your lovely ideas! I luv them, they inspire me. Thank you for the calendar i, I love it. The Year-at-a-Glance would be so pretty printed on a piece of linen like the vintage calendars that were then used as kitchen towels. Your design is so pretty. Thank you. They are lovely, I just printed mine. Thank you! I love the calendar. It’s so sweet of you to share Ann. Always love getting your posts! Bite your tongue!! I am never tired of your post!! The calendar is perfect I’m running to print it out now. I am continually amazed at all of your accomplishments and your ability to share everything about yourself. I respect the fact that I have one friend that freely gives of herself and is willing to share her talents free of charge, while their are many that charge for their gifts. I wish you all the Merriest of Christmases and joy in knowing that our King will return for His Children. Thanks so much for the calendar, I printed it and just love it! Love your posts! You could never have too many! Can never have too many postings from you! I want to read about/see all that you want to share. Thank you so much for brightening my inbox. Thank you so much for the calendar! I love your site, never too many postings! Thank you very much for the printable calendar for 2016! It is simple, yet great! Thanks again! Thank you so much for sharing your hard work on the calendars with us – I will enjoy using this calendar. I am looking forward to your Christmas home tour – keep ’em comin’! Just want you to know how much I enjoy reading your emails. At a time of year, when my email is filled with enticing messages to make me buy more and more stuff, your messages are a representation of what is truly important. My home and my loved ones. Thank you! I love the calendar; thank you. Sometimes I just love to have a calendar that I can write on by hand. This will be very helpful. I only recently came across your site but I am loving it. I could never get tired of your postings Ann, you are always an inspiration. Tired of you? Not likely! You are a refreshing moment in my morning during my first cup of coffee. These little gifts could not be more timely. 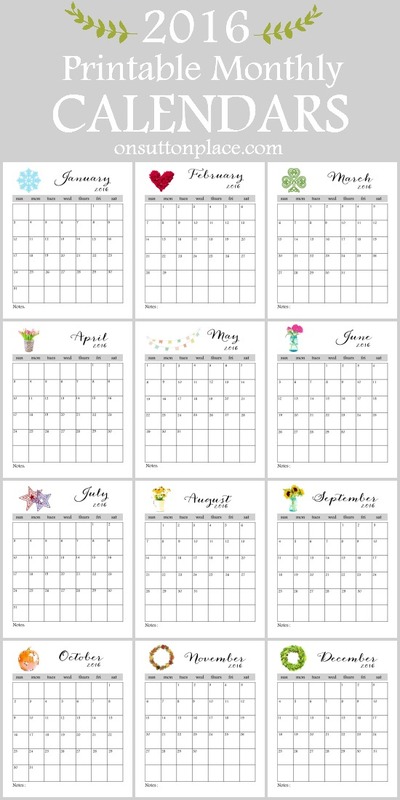 I have a sewing project going on (on my blog) that will run for one year and these full page and single month calendars will suit the tracking and planning journals perfectly! A Sewist must plan her wardrobe and her time carefully and you have just solved a big problem for me. Thank You!!! Awesome calendar! I am anxious to start the “blank slate” of a new year. There is just something about a fresh new calendar that holds such possibility! Thanks so much for sharing so much!Happy holidays!